Copenhagen Fashion Week comes at that perfect moment when we all feel drab and want to throw in the towel when it comes to style. It's too cold and grey to care. 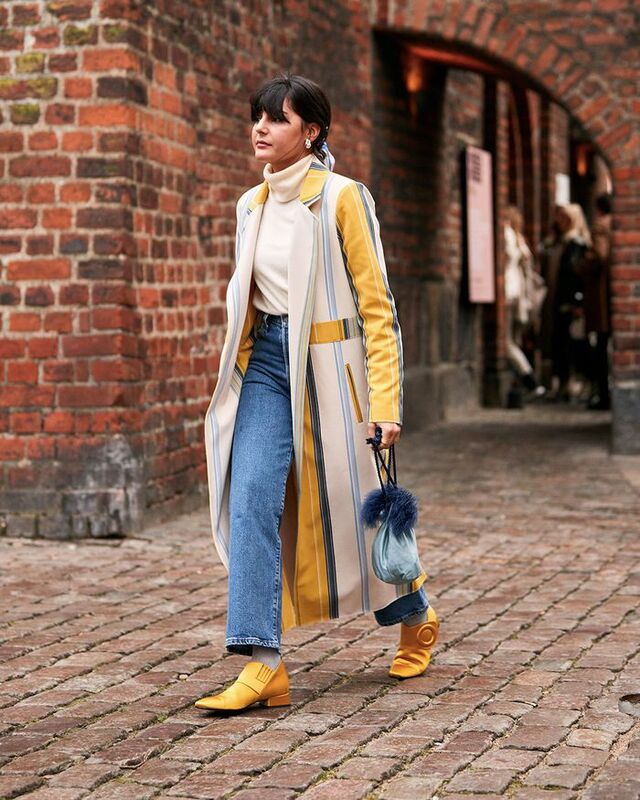 But then, right in the crucial second when we almost give into all the blah, we're hit with the colours, patterns, fluff, cool sneakers and overall hold-the-phone amazingness of Scandi style stars. Even the non-Scandi influencers, buyers and other fashion people that fly in for the occasion can't help but lean towards maximalist looks that outside their comfort zone. There's something magical in the air. Despite the freezing temperatures, the style in Copenhagen is reliably and wonderfully hot, hot, hot. Just like that, we're paying attention again. Not only do the out-of-the-box outfit ideas and wacky new trends wake us up from our sartorial snooze, but every season the Scandi fashion crowd will tell us (via their outfits) about the brands we need in our lives. They breed fashion obsessions as they walk/bike between shows. Suddenly, we don't know how we got dressed before. I barely remember life before Ganni, Stine Goya, Saks Potts, Baum und Pferdgarten or my many other now-favourite Scandi brands. On top of that, the Scandi crowd has a skill of collectively rediscovering classic brands in fresh ways (like Carhartt and Camper, to name a couple). I'm happy to report that this season proved to be no exception. Keep scrolling for this season's batch of Copenhagen cult fashion brands. From Maria Bernad's striped jacket to the signature "hangon" hoodies, Norweigan brand Holzweiler's bright pieces stood out this year—and that's saying something, considering some of the OTT-level outfits. We've been charting Vagabond's comeback since last year after noticing them all over our Instagram feeds. Now the '90s favourite has the Scandi seal of approval after being one of the most-spotted shoe brands all week. Boyy bags have been a street style staple since their launch a few seasons ago, but as they continue to reinvent the brand's signature shape in new sizes, patterns and colours, it still reigns as the It bag of Copenhagen. Pura Utz wasn't quite as everywhere as the other brands on this list, but this Danish brand needed a callout after I spotted Lotta posting its beaded necklaces and bags all week.